What a beautiful way to wish your guests Merry Christmas! This project will leave you "glowing" with pride during the holidays. These beautiful etched votives will make a delightful display for your mantle, sofa table or hall table. 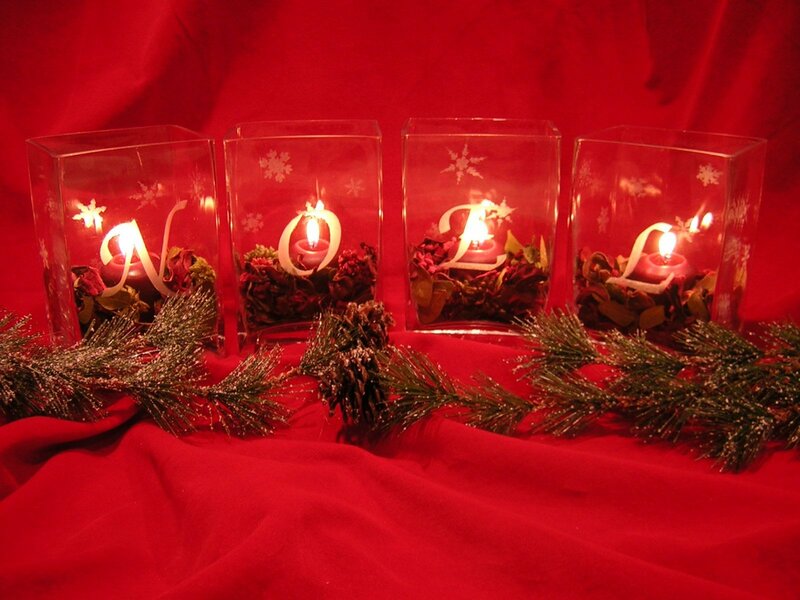 Each votive holder face is etched with a letter to spell out NOEL and the sides adorned with delicate snowflakes. This project is inexpensive (vases run $1-$3 each depending on size) and simple too, taking approximately 2 hours (including drying times) to complete a set of four. After you've made a set for yourself, you'll be hooked, wanting to make them for family and friends alike. Filling the vases with items such as candles, glass beads, potpourri, etc. adds a warm and personal touch. 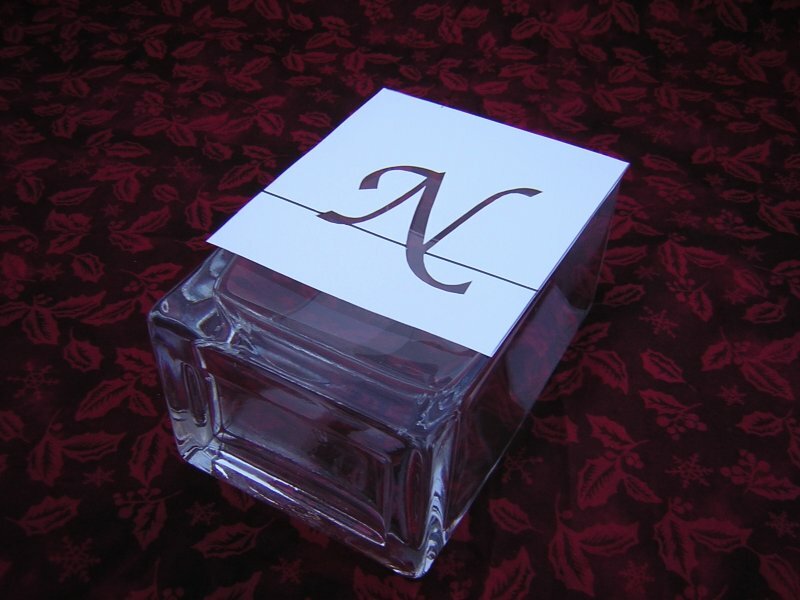 "Brighten" up someone's holiday this year our NOEL vase project! Clean glass vases with alcohol or glass cleaner and allow to dry. Remove the brown backing from the stencil and position the letter stencil on glass votive. Press firmly around the letter making sure the stencil has good surface contact with the glass (try not to touch the glass inside the letter opening). Cover the rest of the votive with tape or paper to protect adjacent areas from overspray. Shake the Frosted Glass Finish well. Holding the can about 10" away from the votive, apply spray to the letter stencil, spraying for approximately a second or two. Apply several thin coats instead of one heavy coat. 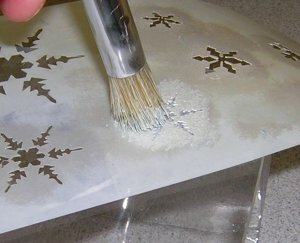 The frosted finish appears glossy immediately after applying but will frost increasingly as it dries. Repeat steps 1-3 until all four votives contain a letter. Allow them to dry for approximately 1 hour. 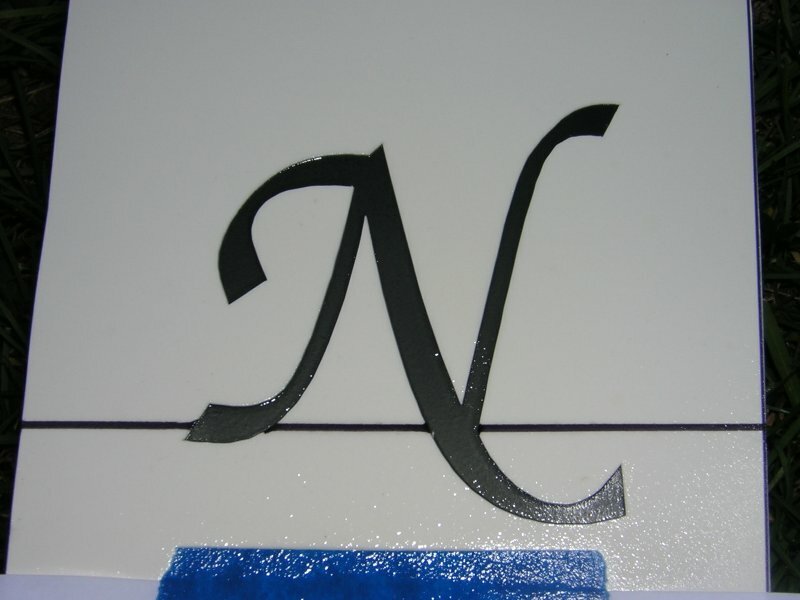 Apply a light coat of repositionable adhesive spray to the back of stencil A291. Allow to dry until tacky. Position the stencil on the votive and apply the paint of your choice using an up and down/dabbing motion. Remove the stencil immediately. We used a liquid acrylic Metallic Pearl White by Folk Art but there are many other paints on the market that will work well. Add color by filling your votives with colored candle stones, marbles, potpourri or candles. 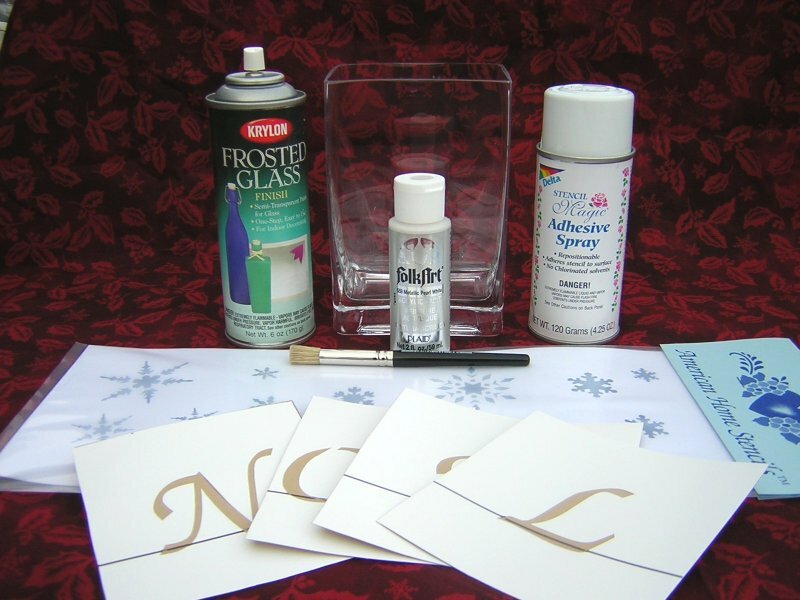 You can use other metallic liquid acrylics or enamels for stenciling the snowflakes or letters. We found that the frosted glass spray really looks like the letters are etched and it is so simple and fast to simply spray the letters on. Liquid acrylic paint, enamels, or frosted glass spray can be used for the snowflakes. 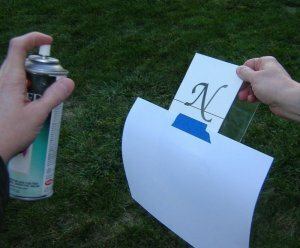 Just make certain you use the spray adhesive on the back of the stencil before applying the paint. We felt the metallic pearl white was very durable, stood out more, adding a nice touch to the glass motives. Don't stop at NOEL, other words like SANTA, JOY, LOVE, PEACE, HOPE, ANGELS, etc. are great for the holidays or other special occasions. 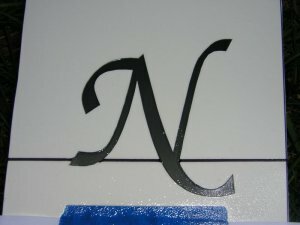 To order these words, please visit our custom lettering stencils page. 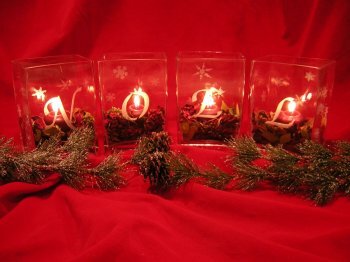 We found our votives at Michael's Arts and Crafts, but similar votives can be found at Wal-Mart, Hobby Lobby, and other large craft stores.